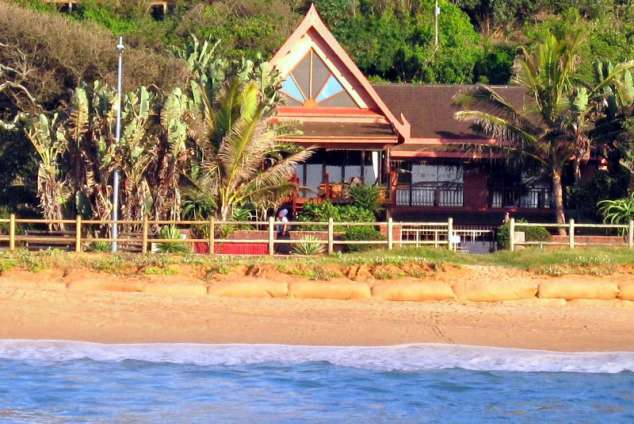 Mei-Pen-Lai - Umdloti Beach Accommodation. The exotic atmosphere of Thai island living experienced on the pristine sands of Umdloti Beach. A place to relax in traditional Thai surrounds in the award winning Thai beach house 'Mei-Pen-Lai ', surf, kite surf, fish or swim in protected waters on your doorstep, dolphin or whale spotting and more. Categorised/graded as 'comfortable with luxury ', and comprising three ground floor self catering suites... two open plan suites each sleeping two persons on Thai opium beds, and one family suite suitable for a couple plus two small children or one additional adult. Fully furnished in Thai/Balinese furniture, with high fanned ceilings, DSTV ( packaged) TV and basic portable braai facilities and on site parking, on a superb surfing beach and nestled in an exotic Balinese garden setting, Mei-Pen-Lai exudes an air of tranquility and translates as "doesn't matter" or "chill out". Situated on the beach on South Beach Road on the unspoilt southern side of Umdloti, Mei-pen-Lai is within 100m of village shops and restaurants and is ideally located to an array of entertainment and activity options from simply strolling or basking on a shell encrusted and shark net protected beach to superb surfing, fishing or horseback riding, and minutes drive to golf courses and casino, microlight flights or parachuting. Umhlanga is less than an hours walk along the deserted beaches of the Hawaan forest and lagoon, or a mere five minutes drive to Umhlanga and Gateway World of Shopping and Entertainment, two minutes drive to Sibaya Casino, with Durban twenty minutes drive away and less than two hours drive to world famous Game Reserves and Lake St Lucia and Drakensburg mountains. Boat rides are available at Umhlanga for dolphin or whale spotting, diving or deep sea fishing. Detail description : Award winning Thai architecture, indigenous Thai/Balinese furniture and setting, reclusive and quiet, yet not even 20 m from water edge and 60 m stroll to top restaurants /pub/food shops. Brilliant surf spots right in front and unspoilt protected beaches. Kite surfing beach and surfing/swimming. Village atmosphere yet only minutes from Casino and Umhlanga . Surf fishing within 60m . 186209 page views since 08 Jan, 2004. Last updated on 31 Jan, 2019.